Leaves are turning yellow, one of my favorite seasons is here. Holidays will be upon us very shortly too. October is the time when most of us schedule Holiday photo sessions and kids have pictures taken at school. These pictures are important because they create precious memories of the childhood that will last for years to come. Personally, I save all of my daughter’s little mementos, thinking that one day, when she has her own kids, she would like to open the box and show it all to her own children. However, shopping for a Holiday outfit for your little girl can be stressful if not approached correctly. After all, she doesn’t need just a dress, which would be fairly easy to find, but she also needs matching headband, shoes, tights and sometimes a shrug to keep her warm. If you are in the same boat as I’m, you probably know how hard it is to find all that in one place. Unfortunately, my 14 year old outgrew kid sizes recently, so I can’t just go to the warehouse and pick something cute for here, like I used to when she was younger. Now I have to go shopping someplace else. And of course, she has to approve everything I buy for her. On many occasions, I tried to go to the mall and get everything I needed in one or two stores, but it was virtually impossible. By the time, I found a dress ( if I was lucky), I was so exhausted that I had no energy to look for matching shoes or accessories. I also tried boutiques, but boutique stores usually carry a small selection and sizes are usually sold-out. Having recognized that need, I realized that it would be nice to find everything you needed in one place. Littlefashionsboutique.com strives to be that one place. We carry a wide selection of beautiful girls’ Holiday dresses, along with matching shoes, hair accessories, tights and socks and lots more. We even show matching accessories on the same page as the outfit in “You will like column”, which means that accessories shown there will match the dress. Unfortunately internet also has it’s limitations, due to various screen resolutions, items may appear different color than they actually are. It may appear that items don’t match at all because pictures were taken with different lighting or different camera. The best way to decide is to see an actual item. And this is what we do here, we put accessories with the dress and see how it looks, before offering them as an outfit must have. If you are in doubt, you can always call or email our customer service and we will help you fin right accessories and answer any questions you may have about an item. Of course, there are basic rules that apply to creating an outfit. If you are going with solids, it’s pretty simple. Just make sure that your shade of red is the same or similar on your accessories. If you are more daring and love mixing colors, or the dress has multiple colors, make sure to alternate colors. For example, if you want to combine gold and ivory, (one of the most popular color schemes after red), make sure to alternate. Example: Ivory headband, gold dress, ivory tights, gold shoes. You want to combine red and gold, do gold headband, red dress, ivory or beige tights, gold shoes. What if the colors are mixed? Well, if the bottom of the dress is gold, wear red tights, if the bottom of the dress is red, wear ivory or gold tights. Simple alternating is the best solution. In some cases, it is not so intuitive and easy, as I mentioned before, it’s not always easy to determine colors online, especially when you are trying to match something you already purchased. So I decided to put some of the Holiday looks together showing different looks with different types of accessories. The first dress is beautiful Haute Baby “Ivy Rose” Tween Slip Dress. 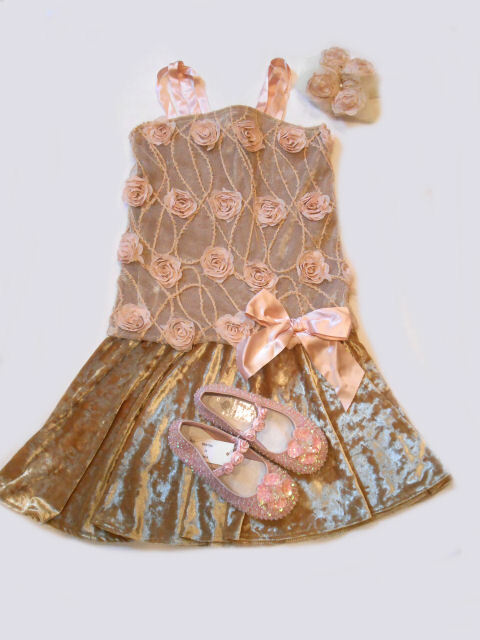 The colors on this dress are soft pink and golden beige, that shimmers and shines and is hard to describe or match. Haute Baby already offers matching ivory and beige bow and ivory shrug. But is is the only option? Of course not. One of the options would be Coastal Projections Sparkly Golden Beige Sequined Shoes w/Rosettes paired with manufacturer’s bow or Golden Rose Heaband by Kids Kapers. headband. So many options are available. Ok, next item is gorgeous Biscotti “Deck the Halls” Festive Red Drop Waist Holiday Dress. This is a traditional rich red tulle bottom dress with sequined bodice and can be easily accessorized with red shoes and bow. But what if you want to try something different? No worries, we have that covered too. How about stunning Joyfolie Valeria Red Satin Holiday Girls Shoes w/Gold Bow & matching Couture Clips Large Gold Glitter Bow Headband. If you don’t want to spend extra money on headband, you can always use a small hair clip that comes with Joyfolie Shoes free of charge. Outfitting your little girls for the Holidays may turn-out to be a stressful and expensive experience, after all we want our little girls to look perfectduring this festive season. We all want the best for our children, but may not always be able to afford it. Because if you add-up the cost of the dress, the shoes and the accessories, not to mention Christmas or Hanukkah gift, it’s going to cost you! Red is a perfect color for the Holidays and little girls look so adorable in festive red dresses. It’s always the most popular color for pictures withSanta and family portraits. She can also wear it for Valentine’s day, if you celebrate it, but beyond that, red is not the most practical choice,although so darn cute. Whether it’s time for that annual family photo shoot or a holiday party, dress her up in this gorgeous Pocket Full of Posies Cranberry Red Tulle Holiday Dress from Biscotti. 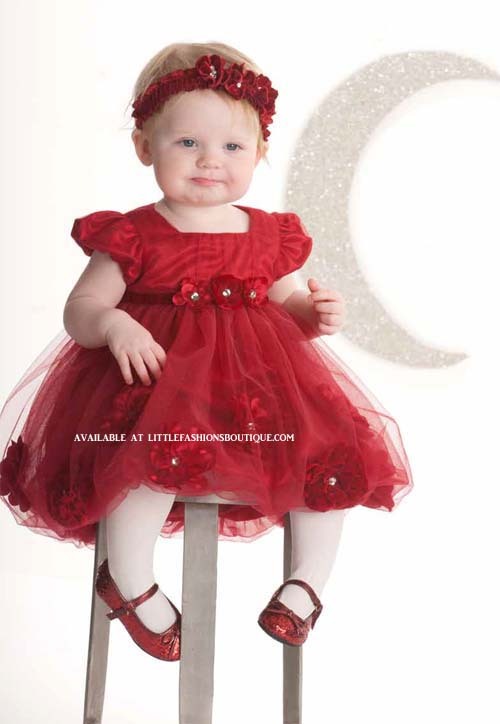 Perfect for your infant or toddler, she’ll look like a winterprincess surrounded by floating layers of rich red tulle. Perfect for parties or other special events, this Biscotti dress sparkles and shines, thanks to beautiful red floral details and jeweled centers. If there’s a big sister or cousin, this dress also comes in a long sleeved style for older girls. Your tween loves to show off her personal style, and there’s no better way than in this Stylish Black and Silver Chiffon Top from Sara Sara. This gorgeous top pairs the latest runway fashions with the shimmer and sparkle that your tweenloves. She’ll adore the glittering silver sequins that adorn the neckline, hem and pocket, and you’ll love the flowing, elegant silhouette. Pair it with a sparkling, black or silver skirt from Sara Sara ( sold separately) for an amazing specialoccasion look for this winter. This is another great dress by Biscotti that will be fantastic both for Christmas and Easter. It’s very versatile and works for all age groups,especially little girls and tweens. When she’s got a special even to look forward to, this gorgeous dress by Biscotti will make her night even morespecial. She’ll feel like a fairytale princess in the ruffled skirt, made from ethereal layers of silvery and aqua tulle. The show-stopper, though, is thesparkling sequined bodice that’s sure to put a shine in her eyes and make it magical for your little girl . To sum-it up, red is not the only color choice for the Holidays these days, in fact gold and silver have become very popular colors in Holiday dressing lately as they are more versatile and go a long way. To view all choices that we offer in our store please visit our Special Occasion Dress section at Littlefashionsboutique.com. Happy shopping and Happy Holidays to all of you from all of us! 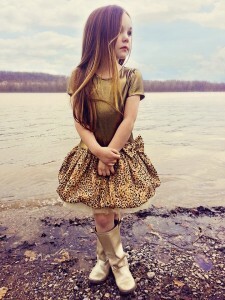 For those of you who are new to Littlefashionsboutique.com, you should know that we specialize in trendy Tween Clothing for girls in size 7 to 16. 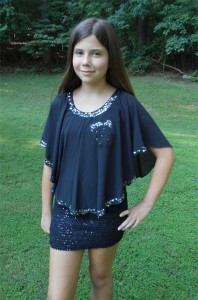 We offer especially amazing selection of Special Occasion Tween Dresses that every picky little girl is sure to love. One of our favorite and most popular collections for tween girls is Sara Sara. Sara Sara is a division of a company that produces a popular little girls collectioin of trendy girls sportswear & dresses – Hannah Banana. Age appropriate and up-to-trend tween dresses by Sara Sara have become a favorite in our store since they day we started carrying this line. We are very excited to present new Fall 2012 Collection by Sara Sara that is now available for pre-order at Littlefashionsboutique.com. Fall 12 Sara Sara collection offers an amazing selection of sequined girls dresses, coloblock tween dresses and fun tween sheath dresses with embelishments and tulle. You can pre-order Sara Sara Fall 12 Dresses now with 25% deposit option using a credit card: American express, Visa or Mastercard, you will be automatically charged only 25% deposit. For those of you who don’t know- Elisa. B is a new Tween Special Occason Girls Collection recently introuduced by the makers of a well known and popular line Lipstik Girls. Elisa. B made their debut during Summer 2011 season and has become an instant favorite at Littlefashionsboutique.com. 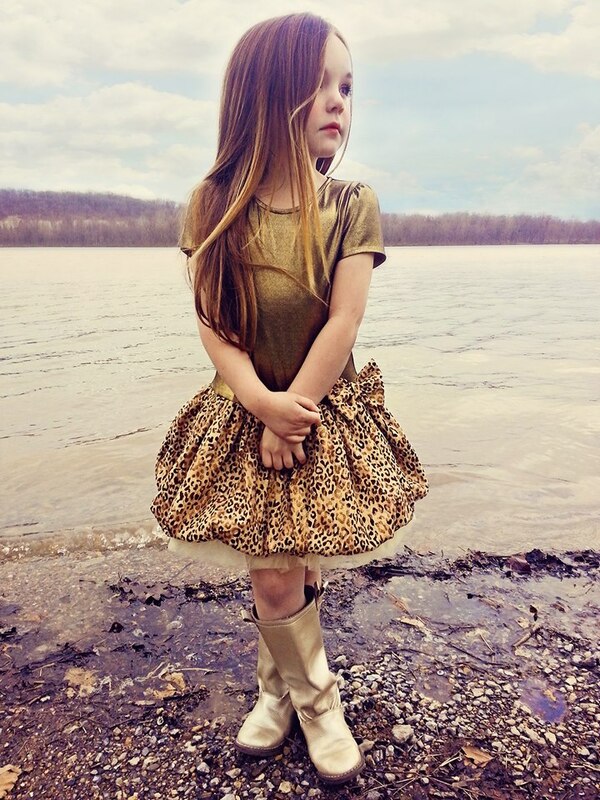 It is not easy to dress choosy tweens- you have to take into consideration their preferences and to make sure that your little girls dress does not look cheesy, is age appropriate and is well made. We ahve been selling Girls party Dresses for the past 6 years and we can assure you that Elisa B Girls Dresses meet all those criterias. They are edgy, but totally age appropriate and are very unique. We are in love with new Fall 2001 Collection for girl from Elisa B and have many syles to choose from. Some of the dresses also avilable in size 4 to 6x. You can pre-order your favorites at Littlefashionsboutique.com right now.